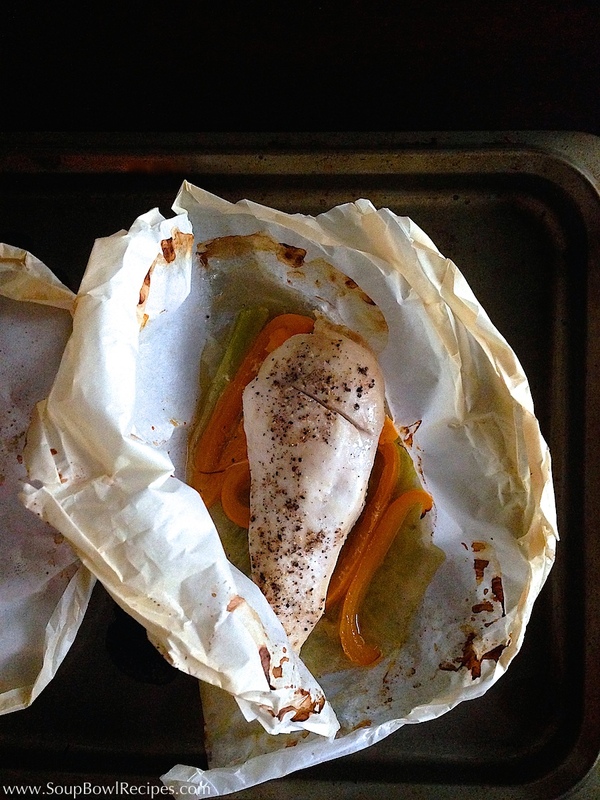 The other night I made one of my all-time-favorite weeknight dishes, Chicken in Parchment, and I thought, Holy cow! This is a super easy, super delicious, super healthy meal — why haven’t I shared it with my readers yet?! And the answer is…I have no idea, because it’s totally something you guys will love. 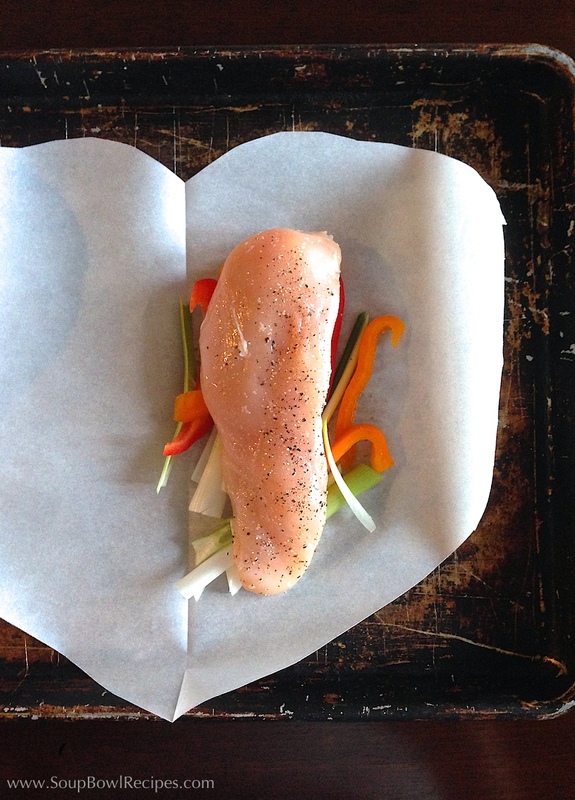 The only special element this recipe requires is parchment paper, which many of us have in our kitchens anyway, and a some mad scissor skills (but if you can cut a paper heart, your golden!). 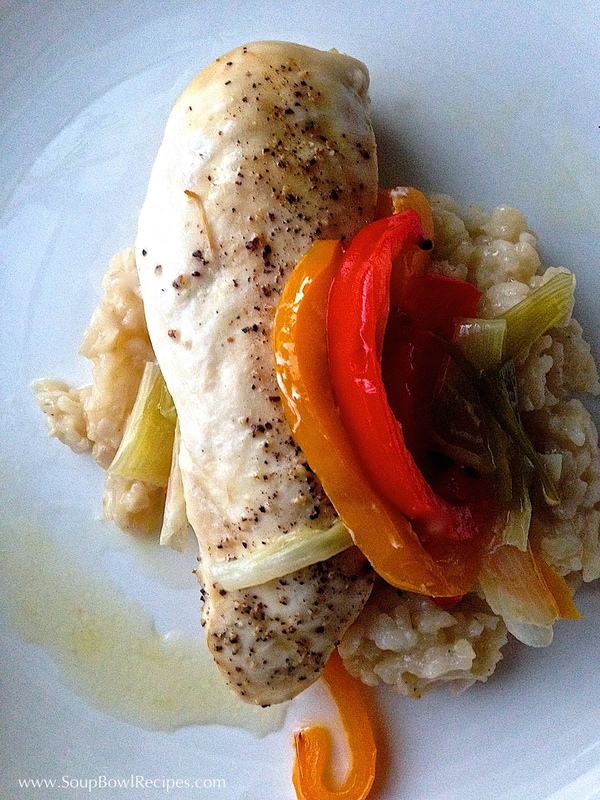 Honestly, this is the most flavorful and healthy way I’ve found to cook white meat. You see, baking the chicken (or fish, which I’ll post next week) in parchment packets, with just a trace amount of liquid, allows you to steam the meat in it’s own broth, making it really moist and tender — kind of like a personal sauna for your chicken. 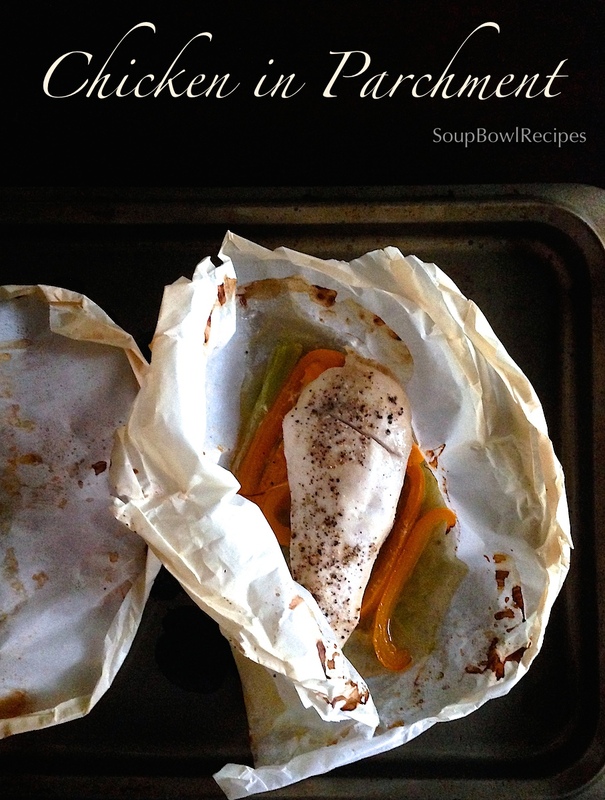 A NOTE ABOUT COOKING IN PARCHMENT: Chicken is a tricky protein to cook; when overdone, it can quickly become dry and flavorless, yet when underdone, it could make you really, really sick. 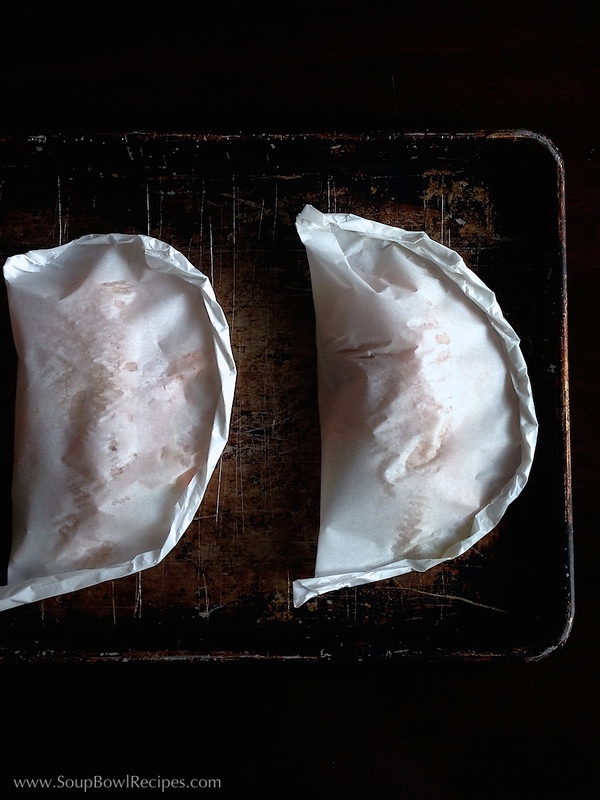 Now, as I mentioned above, cooking chicken in parchment packets helps seal in escaping steam, locking moisture into the meat. Which is awesome. And delicious. But kind of a catch 22. When you’re cooking chicken on your stovetop or outdoor grill, you can easily judge the poultry’s doneness by it’s color, temperature, or the firmness of it’s flesh. But if the chicken is cloaked in darkness (parchment paper), it’s much more difficult to determine when your bird is ready to eat. Okay, so how do we overcome this minor obstacle? Easy! In order to figure out when your chicken is done without cutting into every packet, letting all that wonderfully important steam escape, I always make an extra “sacrificial chicken breast.” Depending on how many people I’m feeding, I buy 1 extra breast that I can periodically slice into during the cooking process. After 15-20 minutes of cooking, I pull the extra packet out, carefully peel back the parchment, and make a small incision in the thickest part of the meat with my knife (you can notice said incision in the photo above). If it’s done, great! If not, close the packet back up and cook for an extra 5 minutes, or until the poor dear is finally cooked through (the FDA recommends an internal temp of 165°F). Your sacrificial chicken will still be delicious, albeit not as tender as the other breasts, but tastes great sliced up and served cold in a lunchtime salad. 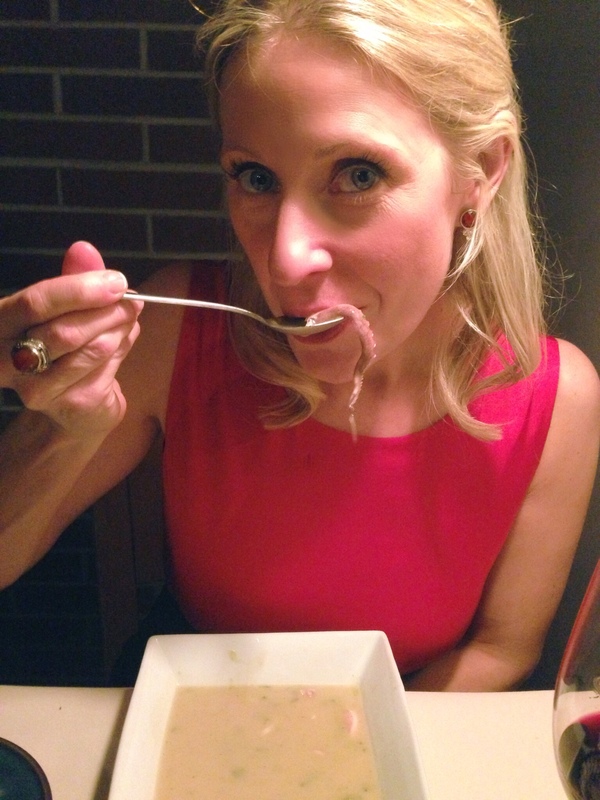 *All of the alcohol in the wine burns off during cooking, making it safe to serve to youngsters, however, if you prefer, you could always replace the wine with a ¼ cup of low-sodium chicken stock instead. Preheat oven to 425° F. Season chicken breasts all over with salt and pepper, set aside. 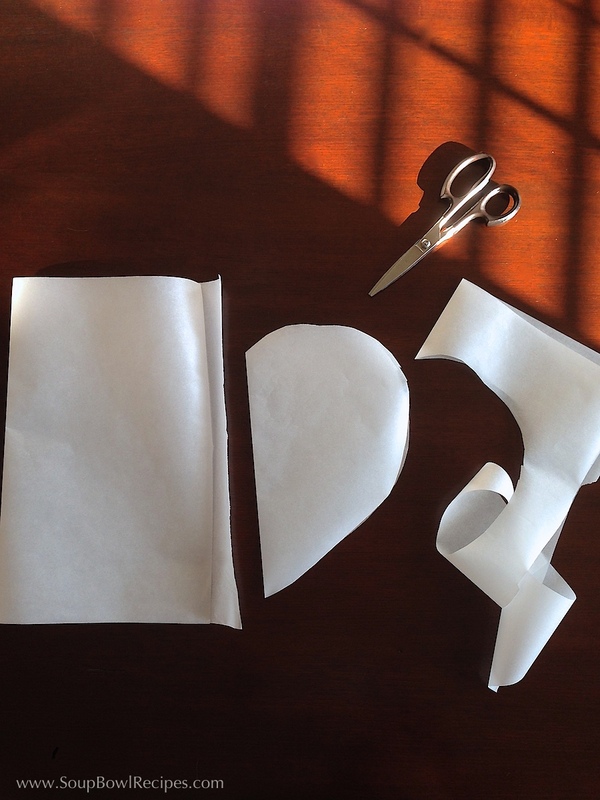 Fold 4 sheets of parchment paper in half, then cut into the shape of half of a heart (I apologize if this requires you to delve back into your elementary school education). 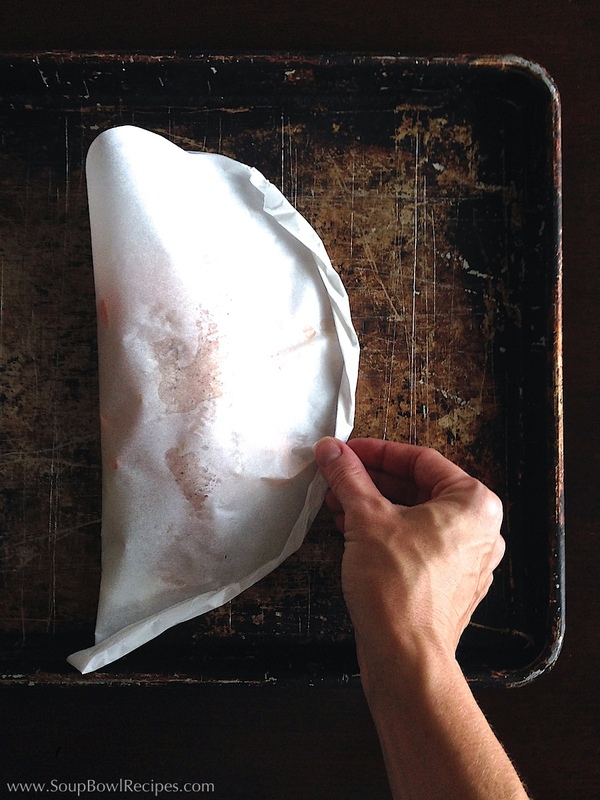 Place unfolded parchment hearts on a baking sheet (for 4 servings, you’ll probably need two baking sheets ). 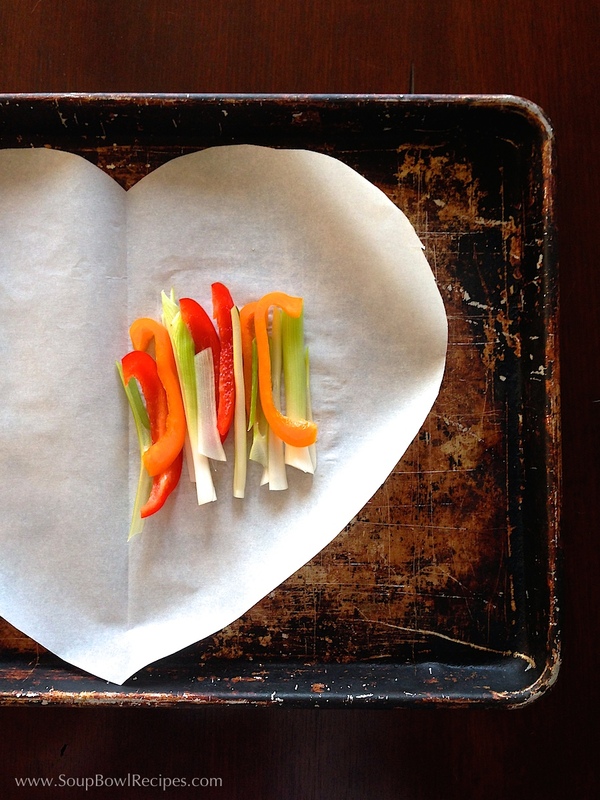 Divide peppers and green onions evenly among the 4 pieces of parchment paper, in a single layer, starting at the seam and stopping halfway across the heart. Rest chicken breasts, dividing evenly among parchment hearts, on top of the peppers and onions. Continue with remaining parchment packets. Bake for 15-20 minutes (or if your oven runs annoyingly cool like mine does, you may need to bake them for 25 minutes). 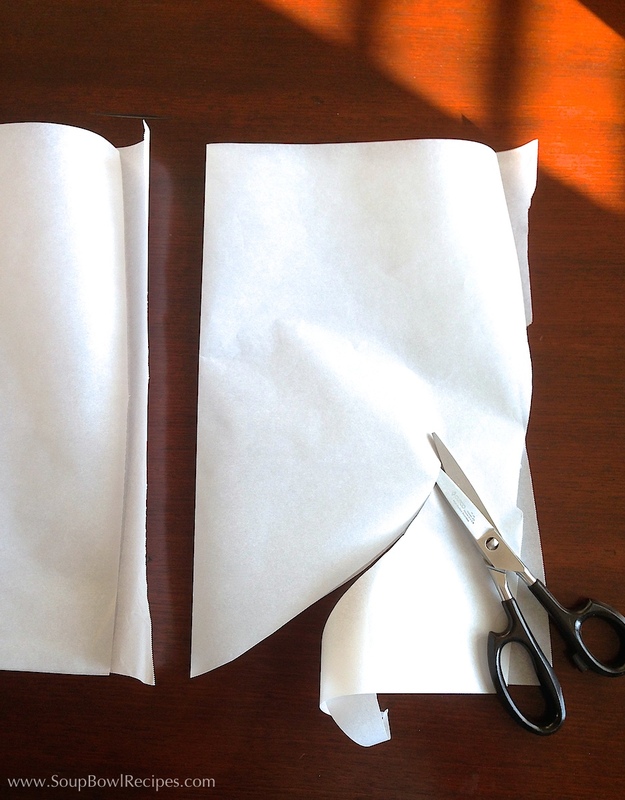 Remove baking sheets from oven, and, using kitchen shears, carefully cut open the parchment packets — seriously, the steam escaping from the packets could melt your face! Allow to rest for 1-2 minutes. With a spatula, lift chicken, peppers, and onions from parchment and lay over top of cooked risotto (my personal choice), brown rice, or sautéed greens. Spoon 1-2 Tbsp of cooking juices (from parchment packets) over chicken. Sidekick: Serve with a chilled glass of Pinot Grigio or Sauvignon Blanc (preferably the wine you used in the parchment packets). 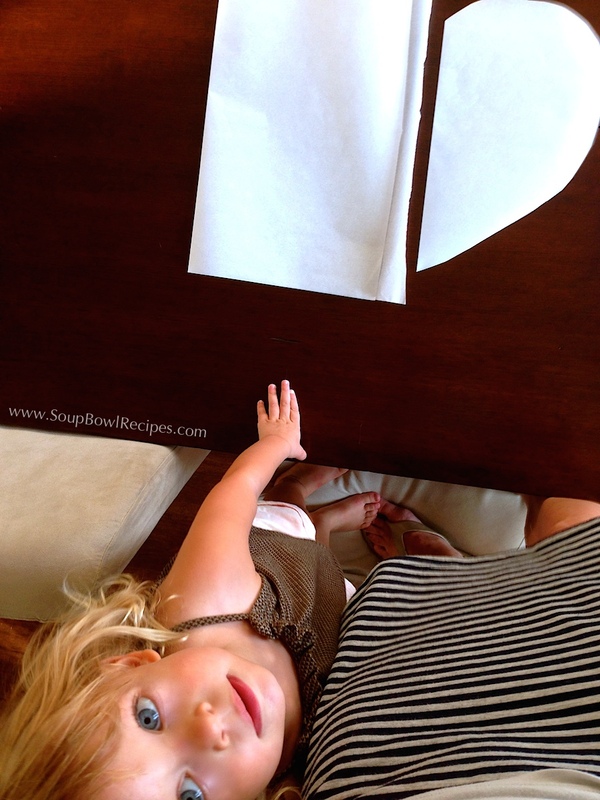 A special thanks to my assistant, The Toddler, for ensuring that the parchment hearts were cut to her perfection, and for also holding my legs during the photo shoot, keeping me safe from falling off of the dining room chair that I was standing on (which is a HUGE no-no in our house).